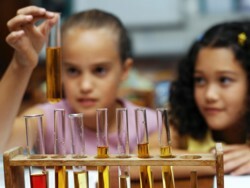 Elementary science fair projects are the stepping blocks for many young scientists. These are the years in which young students can be given the tools to perform a scientific experiment to answer the questions they have about the world. They can learn the skills that will help them right through school and life. To be able to question something and then to find out the answer to it by performing a structured experiment is gold, even if they are not pursuing a scientific career. is such a wide field that the options are truly endless. We will never run out of things to question. Though, this big range of options can overwhelm someone who is trying to find a suitable project. Some science fair ideas may get you started and they will hopefully inspire you to be creative and original. Use your past knowledge and the knowledge of others to put your own spin on the experiments or use them as a launching pad for your own ideas. Some people find it hard to come up with an idea. Either because you can’t think of any experiments you find interesting or because you are trying to make it perfect. Your experiment does not have to revolutionize the way we live our lives. With elementary school science fair projects just be original and creative. parent/teacher is acceptable and advised to the extent of helping to pick out the question and helping with the design process of the experiment. The experiment will only require a short amount of time to perform and only a basic understanding of science. Always check with your science teacher that the experiment you choose is suitable and safe to perform. Remember safety is a key aspect of science and remember to have fun while doing your science fair projects and you might learn a thing or two. Go back from 'Elementary Science Fair Projects' to home.